OWCF has been working hard to support more than 60 grassroots partners around the world for children. Have you ever wondered why we chose to work with them in particular and how much do you know about them? Click here to support our grassroots partners or learn more about their work. There are many advantages of funding at the grassroots level, firstly, better outcomes. Grassroots organisations often are in the best position to understand and address the underlying and systemic forces at the root of the problem as they are in the very front line for their own community. Secondly, lower costs. Comparing with bigger NGOs that regularly incur the costs of travel, accommodations, temporary consultants, and related expenses, grassroots organisations have lower operating costs. However, grassroots organisations often do not get enough support due to low publicity and unable to reach to the general public. They often have scattered efforts with minimal results which also bring to another issue of difficulty to find donors. Moreover, as many of them are in small scales and often lack of resources, they are not able to provide official tax refunds and precise annual reports which makes it hard to gain trust from the donors. Therefore, One World is here to help these grassroots partners to reach to the U.S. and open doors for them to the world by increasing their publicity and help them to fundraise. We work with communities in more than 25 countries across the globe in Africa, Asia, and the Americas. We have helped to distribute more than $7 million directly to our grassroots partners serving more than 1 million children. These funds have created a more equal world for children through access to education, healthcare, shelter, opportunity, and love. While we are living in a society with equal gender rights, this is not the same case in other parts of the world. How bad is the case? The shocking high number of uneducated girls worldwide is worrying. Without proper education, girls cannot fully develop their potentials and it will be difficult to them to find a job. Therefore, One World has been very involved with supporting grassroot organisations in empowering girls and women in countries where they lack access to resources. They provide both mental care and actual resources for the girls living in poverty to receive better and richer education. Three of the many organisations are introduced below to show how they help the people in need. Akili Dada aims to recognise women’s rights and empower women’s leadership. 103 girls are awarded with comprehensive scholarships to Kenya’s top national schools, and 100% of them have graduated and moved on to universities successfully. Girls can develop their potentials by attending educational programmes on skills training and leadership development, or joining mentorship programmes. The mission of Mubarika Campus is to provide rich education for poor children in Pakistan, especially girls. Over 1,000 children in 13 villages in rural Pakistan are benefitted. Girls can receive vocational trainings through additional programmes. With higher investment, students’ capacity can be increased and facilities can be improved. 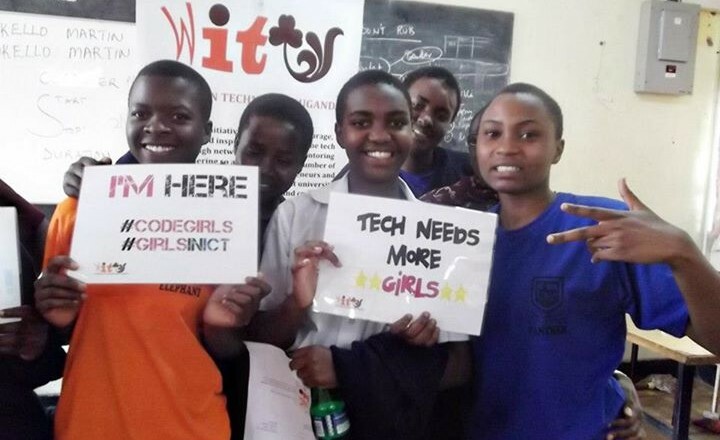 In a hope to get young women out of poverty, Women in Technology Uganda provides them with Science, Technology, Engineering and Math(STEM) and business education, then connects them to digital jobs. It provides industry-related training opportunities, mentoring and networking opportunities in a way that women could come and learn from each other. The goal of One World is to empower organisations like them to promote the equal rights and opportunities of women in the modern society. If you want to give them a helping hand, don’t hesitate to donate to One World, or check out the One World’s partner list and support these organisations! Tingathe means “we can” in Chichewa, the national language of Malawi. Sarah Lindire, founder and executive director of Tingathe, was born and raised in Malawi and had first-hand experiences with the struggles young people faced in her community. She later became one of Malawi’s youth ambassadors with the British Council Global Change Makers Program and developed community action projects. She then worked for several INGOS (International Non-Governmental Organizations), including the UNDP (United Nations Development Programme) and UN Women. She became a gender and governance specialist who often worked with young women specifically in poor areas, neighborhoods, and slums all by the age of 28. After millions of dollars later from different development programs, Sarah saw no real changes in communities. In a critical attempt to understand the lack of progress, Sarah sat down with groups of young women and had conversations about their current situations, needs, and hopes for the future. These women responded, “The things you are doing is nice, but no one really asks us about [those] things so that’s why nothing really works. They don't ask us because we are not educated, we don't speak English, and we don’t make money. Yet somehow we still manage. Maybe if people asked us what works, then we would tell you.” Then Sarah started to listen. What started from a single conversation turned into over two years of research, consisting of focus group discussions to uncover the transient needs of the community. Instead of referring to the area that Tingathe works in as a slum, Sarah calls it a Peri-urban area that houses thousands of young people from different tribes ranging from vastly diverse cultures, languages, and backgrounds. It is very difficult to penetrate peri-urban areas because they are communities that have been abused and overlooked by many. Despite these challenges, Sarah had no intentions of giving up on her community. Instead of merely giving supplies and resources, Tingathe builds relationships with other organizations, governments, and individuals who are invested in understanding the issues faced by the young people in the community. Upon our closing remarks, we asked Sarah if she had advice for young people who are interested in helping their local communities but do not know where to start. Her response was similar to how she first developed her passion to start Tingathe: The best place to start is listening. She states that “human sight is very complicated and to be able to truly understand the issue, you need to ask questions, listen, and be a part of the community before deciding what needs to be done.” Similar to the meaning of “Tingathe”, we can have the power to inspire and develop long-term change, but we first have to listen and understand the community. We hope that everyone in the One World Community had a wonderful Valentine's Day earlier this week! It's been a busy month here at OWCF with our first round of community calls with One World Partners and Volunteers, and with... read more. Earlier this week I was fortunate enough to speak with Stewart Lunanga, one of the co-founders of CAMME (DRC), and recipient of the Young African Leaders Initiative (YALI) Mandela Fellowship, about his childhood, inspiration, and where he sees CAMME headed in the future. We are also pleased to announce that Stewart will be speaking at One World's reception on July 23rd in Atherton, CA. What inspired you to start CAMME? "My own life experience inspired me to start CAMME. I grew up in a period of war where the situation was really dangerous and we had to flee, and I also grew up with a single mother. Both of these situations helped me want to want to help my country. There is no future for the youth. There is no leadership. And that whats inspired me to start CAMME; for the children of the DR Congo." How have you seen CAMME’s mission help the children of the DRC? "From the creation of CAMME we started teaching exploited youth skills. We've been able to help more than 2,000 kids in the region. Some of them are entrepreneurs, some work in different workshops. We have noticed it’s been very impactful since we’ve been seeing the results of them in the communities we work with." How did growing up in Bukavu affect your life? "When I was growing up in Bukavu, it was in the period where we had the massive movement of refugees and Mobutu was in power. He’d sent all of the military from the western part [of the DRC] to the eastern part. They were able to commits all types of violence against the people. Afterwards, there was war. We had to leave, and people had to move from mountains to mountains." What is one thing you would like Americans to know about the DRC? "What I would like to tell Americans about the DRC, is that [the DRC] is a beautiful country. It is one of the richest countries in the world, but the population is poor. There is a lack of leadership, but we are trying to build a new legacy for the future Congo." How has CAMME benefited from working with OWCF? "Without OWCF I don’t know where we would be. Were using the platform to raise funds, [OWCF] has raised awareness of our program. My own experience is on the ground. I was able to travel for the first time from Congo to Uganda because OWCF last year. I had the experience of meeting with other leaders from other countries at a philanthropic conference, and this has given me a different perspective." What would be a good way to help you and the mission of CAMME succeed? "The [buildings] that are being built are helping CAMME to become more self-sufficient and helping us to succeed. I can really say we will have benefitted by being able to add more buildings for classrooms. I think we will see real growth in the next 3 years." You can read more about Stewart, CAMME's mission, and how you can help here. After more than nine months as an intern it is, unfortunately, time for me to move back to Denmark. I feel lucky to have been a part of this organization where I got the chance to both use and develop my communication and storytelling skills. One World Children’s Fund works with grassroots organizations around the world to create a more equal world. One of the biggest benefits has been working on different tasks and producing content for different platforms. I have been contributing to the website, social media (Facebook, Instagram and Twitter), a photo essay, an updated media list besides video editing, writing a press release, lay outing flyers, text editing and helped execute a successful charity night. Shortly after I entered the organization I was given tasks let alone responsibility. My ideas were always welcome and both working from home and in office I felt listened to and as a part of the team. Together with Rucha Chitnis a story telling project ended up with an interesting photo essay on Bitone Center in Uganda. I transcribed interviews, wrote the first draft, we edited the content together, and I was responsible for the photo captions. My cooperation with both Branco from Uganda and Rucha Chitnis for OWCF ended up with a great result (find the photo essay here). Not long after I joined the organization I was a part of both planning and executing a charity event – One Night for One World. I got an insight into all the minor details that needed to be taken care off prior to the event, and I got to experience the atmosphere at the event. Mainly I did lay out for some flyers prior to the event and during the event I networked and was responsible for updating social media about the event. Social media platforms have been a huge part of my effort at OWCF. I have been posting on Facebook through out my entire internship, and I have experienced great feedback from the team about my ideas for posting. At the end of my time at the organization I have been editing videos from One Night for One World being used in the campaign #WearetheLEADERS and it has been important for me to produce different versions of the videos so they can be used on both the website and social media. Kevin Erdman made the original footage. I therefor created four shorter videos and scheduled them for Facebook posts and one longer video combining all four interviews which is posted here on the website. I have incorporated the longer version in the end of this post. One of my final tasks has been producing press release from scratch about a school in the local area. I was also responsible for sending the press release to relevant medias. To achieve the best result I researched on both the school, their project and on the local medias. This turned into an updated media list, which OWCF can use in the future for press releases. I am happy with the results I have been able to create together with the team during the last nine months. And I am happy that I have been a part of an organization with values such as respect, generosity and community that strives for a world where children have access to education, healthcare and feel safe – a brighter future for children all around the world. If you like to solve a lot of different tasks and if you a not afraid of responsibility and bringing your own ideas to the table, I recommended that you get involved with OWCF. In the depths of the Western Uganda district of Mbarara lies a small happy village called Katereza. It is gifted by nature away from the pollution of the bustles and hustles of the town, presenting an apt countryside environment. All this could have been worth the savour, but this settlement is marred by the appalling state of schools, no access to healthcare, limited access to electricity and nail biting poverty. Katereza’s population is 60% of school going age. The answer to this call is that there is only one school - Katereza primary school - whose numbers drop per year that passes. According to a baseline study done by RAHU and the Global Livingston Institute, 60% of the mothers have given birth without the guidance of or care from a trained medical personnel. Most of the 1500 households in the village use kerosene lanterns as a power source by night fall, and these have been known to cause arson-related hazards in places with similar characteristics. In the wake of these challenges, Katereza Community Alliance (KCA), an initiative by Reach A Hand Uganda (RAHU)’s adopt a village program with the interests of Katereza at heart, steps in. Being a youth-led non-profit initiative, KCA aims at empowering the village by placing emphasis on the spheres of education through early childhood literacy, renovating the only school, improving healthcare by providing a health centre, poverty alleviation and providing renewable and alternative energy sources (electricity) like solar. 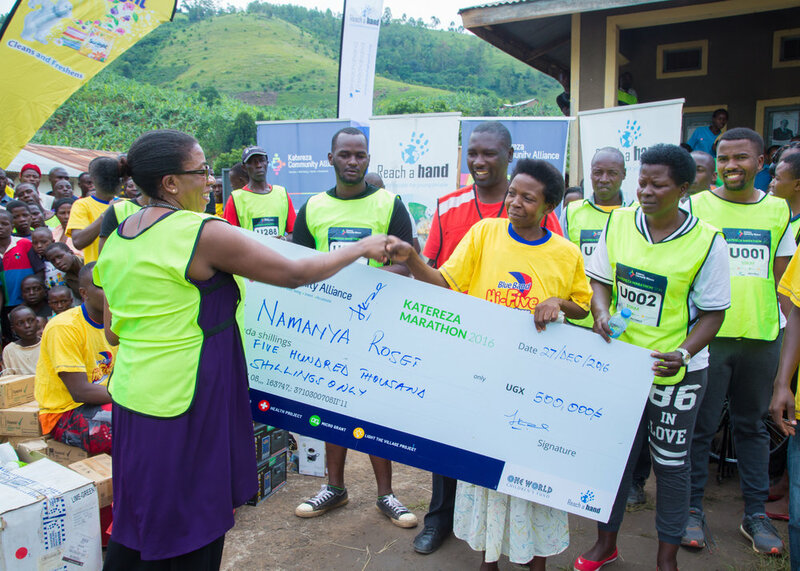 The Katereza Marathon came in as a first of its kind event. It was a charity based run, aimed at bringing to reality one of the ambitions of KCA - improved health service delivery. To zero it down more, every single penny raised was to be allocated to the construction of Katereza Community Health Centre, which too would be the first of its kind in the remote village. The event was slated for and executed on December 27th 2016, also coming in as a late Christmas gift for the ‘Katerezans’ who contributed to the marathon through participating after paying a modest fee. It also attracted sponsors and well-wishers, especially Unilever Uganda who provided gift hampers and prizes as well as and One World Children’s Fund who blessed KCA with its first grant. 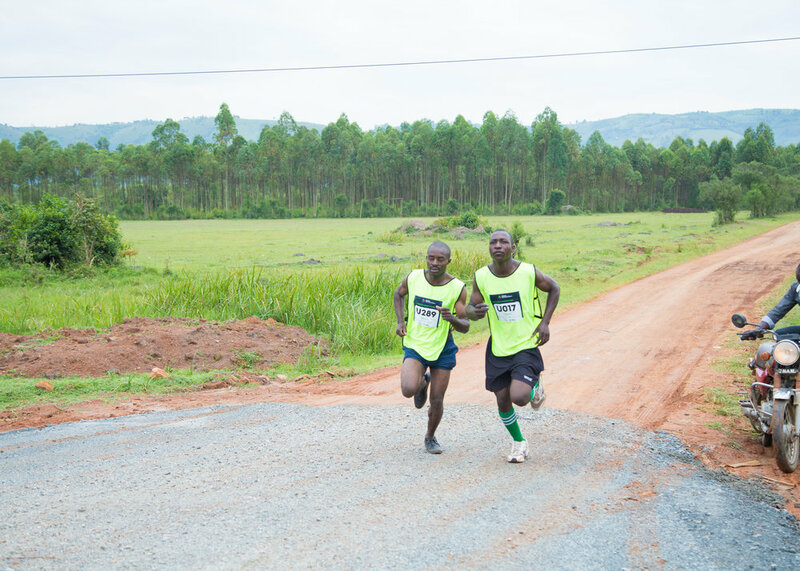 It was a 10km long race, and the participants felt every impact there is about a marathon. The sweat, fatigue and exhaustion crept up, and some runners yielded and fell off the course. However, a good number persevered and managed to reach the finish line, with Gift Bagembe finishing ahead of all and taking the cash prize of 500,000 UGX home. Athan Ananukire, one of the participants in the run referred to the marathon as a mind blowing experience. “It was great seeing different people of different age and wealth levels coming together to run for a common challenge. It certainly gave us, Katereza residents the feel of Christmas joy” mentioned. Reach A Hand Team Leader Humphrey Nabimanya heralded the marathon as a key uniting factor among Katerezans and the outer community, using the success to foresee a brighter future for the community. “This year’s run brought together so many people who appreciated the cause. I can see Katereza with improved structures and systems in health, education and economical empowerment of young women and girls” Humphrey said. The run will be an annual event, serving as a uniting factor for the residents and well wishers, and also as an income generator for the activities. As Humphrey said, there is no better way to help people than to have them involved. Aisha Nabitosi says the purpose of her life is to make people feel they are not alone. “I lost my father when I was very young. When I first came to Bitone, I felt alone and didn’t have love my heart,” she said. 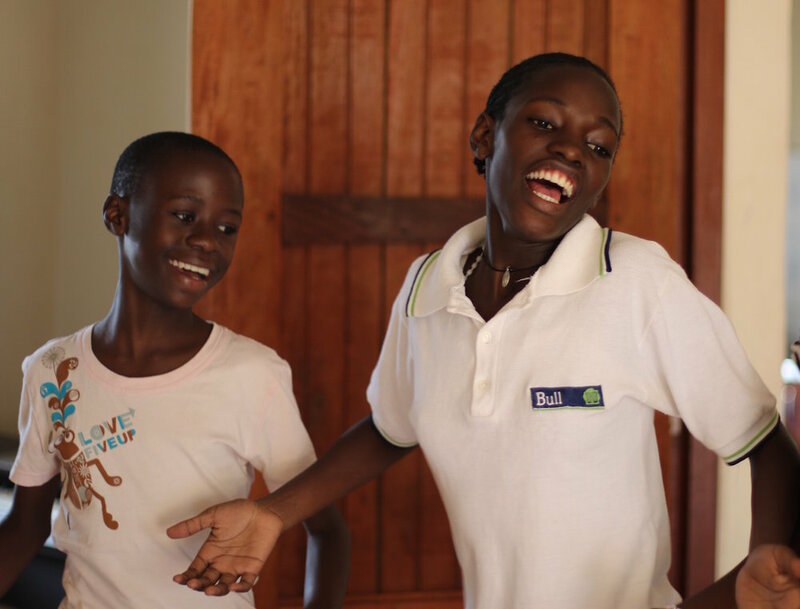 When Aisha was 14, she connected with Bitone Center, a Kampala-based group that uses traditional dance and music to heal trauma and build the leadership of vulnerable children and youth. 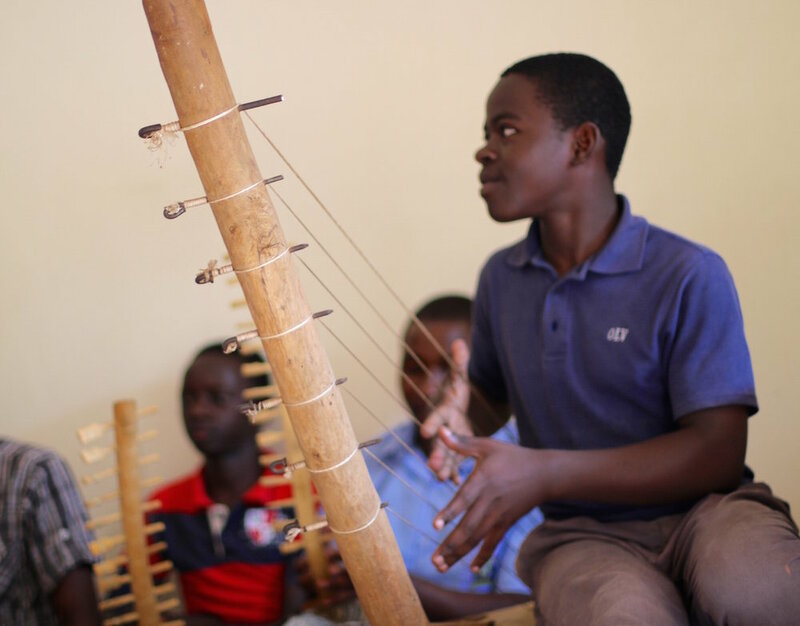 The rhythms of traditional Ugandan music fill up the rooms of Bitone Center. 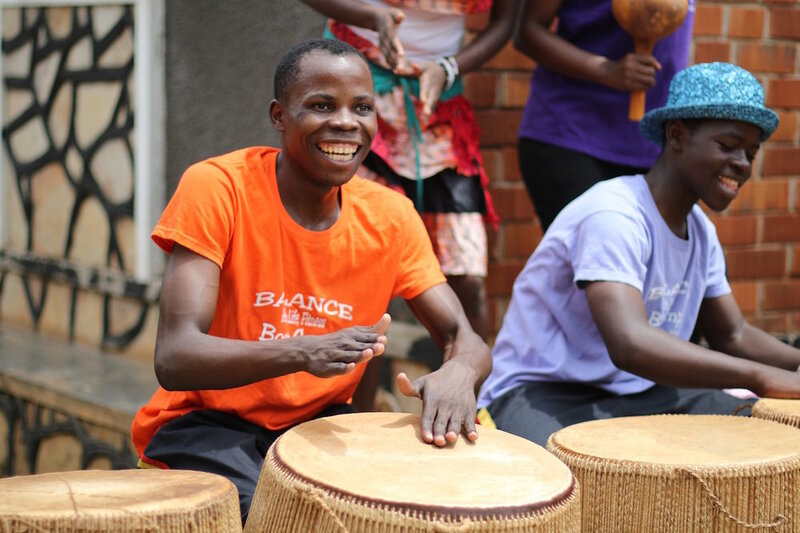 Bitone was founded by Branco Sekalegga, who felt it was important to create holistic models for leadership development by allowing children to explore the rich cultural heritage of traditional Ugandan performing arts. “I grew up in difficult circumstances, but I was able to go to school and received a scholarship to go to college. I felt it was important to give back to the community to other children, like me,” said Branco. Branco Sekalegga is the founder and Executive Director at Bitone. He believes that traditional arts are powerful tools for healing trauma and building youth leadership. The big vision of Bitone team is to create a performance troupe, where youth can showcase their talents and build their leadership and interpersonal skills. “Music is powerful. It gives children, who have experienced trauma, an opportunity to express themselves and understand their self worth and potential”, said Branco. The Center is also home to nearly 18 children and youth, who receive education, room and boarding. 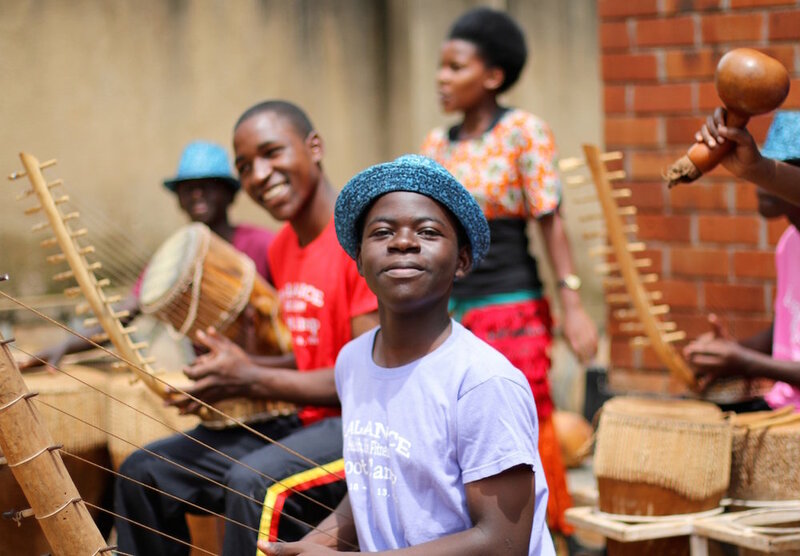 Desire Nakibirango, the Center Coordinator, sees Bitone as part of a larger vision to touch the lives of other vulnerable children through music and dance. “We have a passion to see children empowered and their talents recognized,” she said. The Center also teaches children food gardening to strengthen their self sufficiency. They now want to lease land, where they can grow their own food, build a home and theater for youth performances. “We are are nurturing a nursery bed of the next generation of leaders,” said Branco. transformative therapy of physical exercise. difficulties, depression or Post Traumatic Stress Disorder. And increasingly so, some are homeless. nothing but mind, speech and body. them from rising above the dance floor. what they can do with who they authentically are. day ready to participate and absorb the knowledge from my master is essential. children orient themselves towards a hope-filled future.